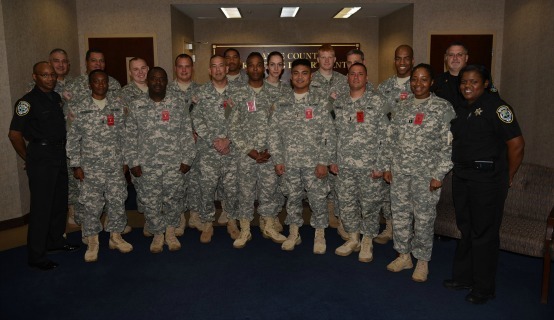 The Orange County Corrections Department (OCCD) was pleased to host the 3/347th Regiment based in Orlando, on Friday, April 10, for an inside look at county jail operations. The group of about 25 service men and women were given a behind-the-scenes tour of the Orange County Jail, one of the largest in the nation, in preparation for their various military assignments. The reservists included several local and statewide deputy sheriffs as well as correctional officers, many of whom will work or train those who will work within protective services, fire and corrections capacities overseas. For some of the guests, the visit provided a first glimpse inside an operational detention facility. The 25 service men and women were welcomed by Chief of Corrections Cornita A. Riley and Deputy Chief Paulette Juliene, who is also former military, along with other retired military staff now at OCCD including Maj. Rich Powell and several master correctional officers. Of special interest, was the agency’s veterans’ dorm, which currently houses approximately 25 inmates who were honorably discharged from military service prior to their arrest.